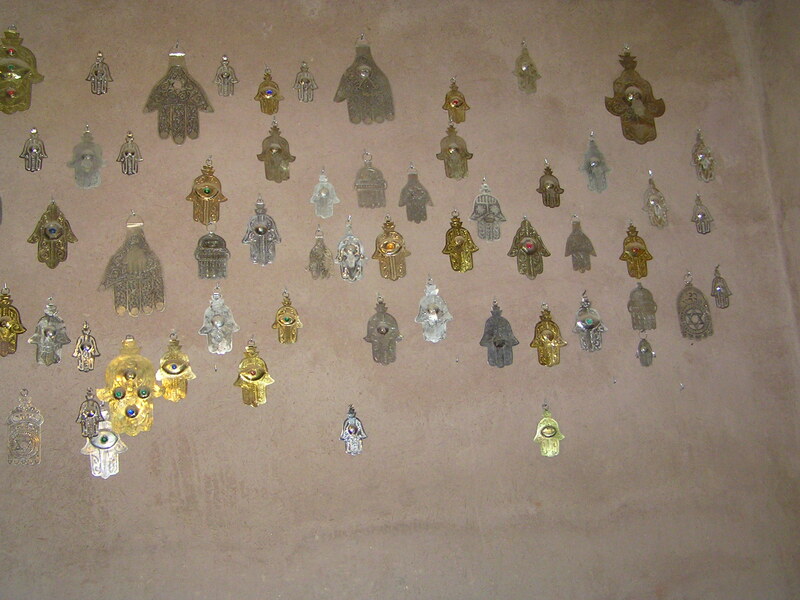 When travelling in Morocco, you will come across the Hand of Fatima in jewellery shops (as beautiful pendants) or as door knockers on peoples homes – and it is used to ward off the evil eye. The Hand of Fatima, also known as Khamsa (meaning “five”), is named after Mohamed’s daughter, Fatima Zahra. Arab’s are quite superstitious and jealousy is a very common trait. Thus if you have a new job, a great career, a new house/car, or you are making lots of money, it is important to protect yourself from the evil eye of jealous neighbours. A malicious stare from a jealous person can cause illness, death, or just general bad luck. Now none of us want any of that! In Arab tradition the number five is exemplified in the saying khamsa fi ainek (“five [fingers] in your eye”). Raising one’s right hand with the palm showing and the fingers slightly apart is part of this curse meant “to blind the aggressor.” Another formula uttered against the evil eye in Arabic, but without hand gestures, is khamsa wa-khamis (“five and Thursday”). As the fifth day of the week, Thursday is considered a good day for magic rites and pilgrimages to the tombs of revered saints to counteract the effects of the evil eye. The number five in Islam is connected to the open hand, the pentagram of the five senses, marriage, the Five Pillars of Islam, the five daily prayers, and the hand of Fatima. Hands of Fatima make great decorations too! The Hand of Fatima can also be found in Christianity and Judaism. Levantine Christians call it the hand of Mary, for the Virgin Mary. Jews refer to it as the hand of Miriam in remembrance of the biblical Miriam, sister of Moses and Aaron. Egyptian women who live in baladi (“traditional”) urban quarters often make khamaysa which are amulets made up of five (khamsa) objects to attach to their children’s hair or black aprons. The five objects can be made of peppers, hands, circles, or stars hanging from hooks. 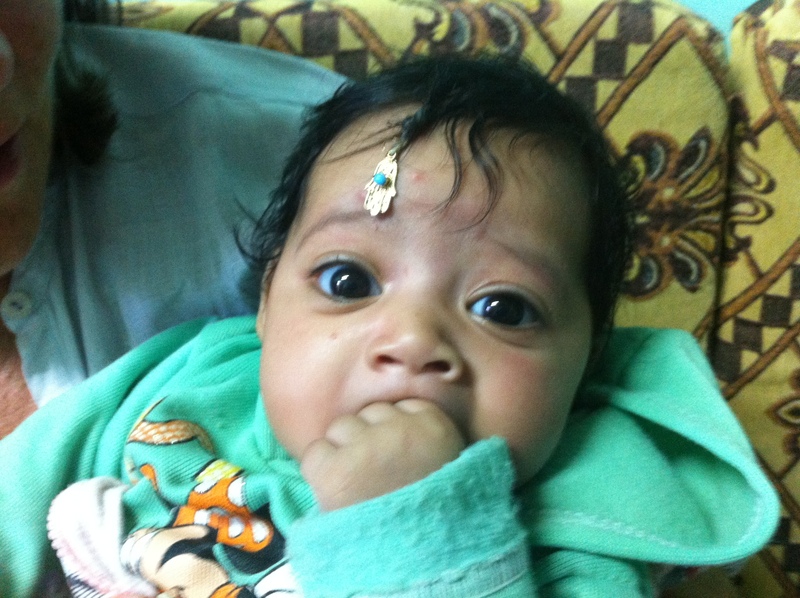 This sweet Bedouin baby has a Khamsa in her hair. As for me….I just think it is a beautiful symbol… but I do have a couple of them sewn onto my handbag to protect it from evil eyes and hands!